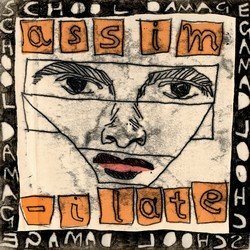 A To X is the second album by Melbourne DIY pop quartet School Damage (no relation to the Canadian band of the same name). The new album focuses their simultaneously sharp and wobbly DIY pop aesthetic, taking in the wooziness of Young Marble Giants, the bite of Devo and the busy melodies of the Television Personalities. A To X comes hot on the heels of School Damage’s instantly loveable 2017 debut, which earned the band raves from Brooklyn Vegan, Noisey and BBC6 among others. Formed as a bedroom pop project for Carolyn Hawkins (Chook Race, Parsnip) and Jake Robertson (Ausmuteants, Hierophants, Frowning Clouds), School Damage now include Jeff Raty on drums and Dani Damage on bass. They have released cassettes and 7”s on various labels, including a 7” for UK label Upset The Rhythm. They’ve played King Gizzard’s festival Gizzfest and shared stages with The Bats, Tropical F*ckstorm and NO ZU.